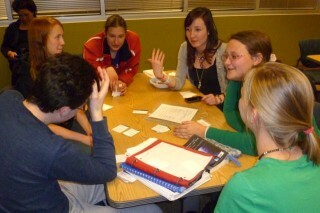 Planning and hosting a great teen science café is all in the details. So, we created a checklist and set about our work. ✔ Recruit youth leaders and conduct training. ✔Brainstorm list of known high quality local presenters who might be able to handle the topics. ✔ Have youth leaders rate a list of possible topics for our café events. ✔ Confer with partner nodes in our local network to select five best topics from students’ ratings. ✔ Decide which partner node will take the lead on developing the programming for each topic. Our partners at the Academy of Science-St. Louis, which already has a well-established network of scientists, volunteered to take on our number one ranked topic for our first café: Zombies. They identified Dr. Terri Rebmann from Saint Louis University, a researcher specializing in disaster-preparedness and infectious diseases. I contacted her to ask whether she could do a teen science café in the area of her expertise, but with a zombie twist to pull them in. She readily agreed. I sent her documents that described the general nature of the Teen Science Café commitment and arranged a face-to-face introduction and informal training. We met over a very casual lunch at a local bakery/sandwich shop, where we spent time discussing the form and purpose of a teen café, the details of her commitment and role as the presenter, and tips for developing a presentation and communicating to a teen audience. Within an hour, we had planned most of the café, including exciting kinesthetic and hands-on components. We both left with a very positive outlook; the only thing left to do on my end was to prepare the youth leaders. We met with each of the youth leadership teams (YLT) from all three nodes to establish café dates, create timelines, choose YLT customized uniforms (T-shirts and hoodies with a graphic of their choice), and for committees to make “to-do” lists for the event. After revealing that the upcoming café would be zombie-themed, the kids were given a budget and they began performing their planning duties, which included drafting and practicing introductions/closing remarks, finding decorations and door prizes, developing food menus, designing and distributing fliers, and creating floor plans for seating. These tasks were planned for in our YLT meeting. Key planning activities included updating our Facebook site with zombie-related articles, connecting our Facebook page with a Google Hangout to stimulate buzz about zombies. At the first YLT meeting, we learned from our discussion of zombies that the youth leaders had a keen interest in learning more about anatomy. So, as a special reward for their efforts, we scheduled a dissection lab for them at a local university. In a future post, I will tell you how it went!